ATLANTIC CITY, N.J. Windmills off the East Coast could generate enough electricity to replace most, if not all, the coal-fired power plants in the United States, Interior Secretary Ken Salazar said Monday.But those numbers were challenged as “overly optimistic” by a coal industry group, which noted that half the nation’s electricity currently comes from coal-fired power plants.The secretary spoke at a public hearing in Atlantic City on how the nation’s offshore areas can be tapped to meet America’s energy needs.”The idea that wind energy has the potential to replace most of our coal-burning power today is a very real possibility,” he said. “It is not technology that is pie-in-the sky; it is here and now.”Offshore energy production, however, might not be limited to wind power, Salazar said. A moratorium on offshore oil drilling has expired, and President Barack Obama and Congress must decide whether to allow drilling off the East Coast.”We know there are some people who want us to close the door on that,” he said. “We need to look at all forms of energy as we move forward into a new energy frontier.”Salazar said ocean winds along the East Coast can generate 1 million megawatts of power, roughly the equivalent of 3,000 medium-sized coal-fired power plants, or nearly five times the number of coal plants now operating in the United States, according to the Energy Department.Salazar could not estimate how many windmills might be needed to generate 1 million megawatts of power, saying it would depend on their size and how far from the coast they were located.Mark Rodgers, a spokesman for Cape Wind, which wants to build a wind farm off Cape Cod, Mass., estimates it would take hundreds of thousands of windmills. The average wind turbine today generates 2 to 5 megawatts per unit, he said.”It would taker a number of years to build out, but we’ve got to get going in this country with the first few projects,” he said.Jason Hayes, a spokesman for the American Coal Council, said he was puzzled by Salazar’s projections. 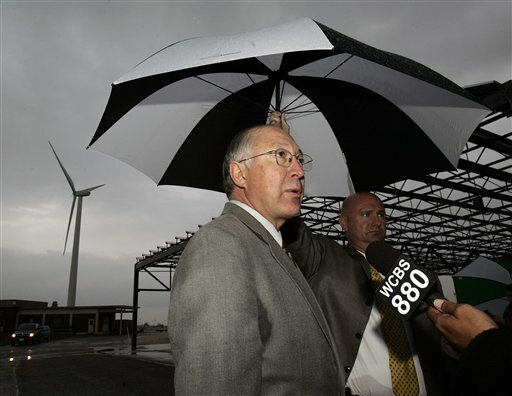 He said wind power plants face roadblocks including local opposition, concerns about their impact on wildlife, and problems in efficiently transmitting power from far offshore.”It really is a stretch,” he said of Salazar’s estimate. “How you put that many new (wind) plants up, especially in deep water, is confusing. Even if you could do what he said, you still need to deal with the fact that the best wind plants generate power about 30 percent of the time. There’s got to be something to back that up.”Monday’s hearing was hosted by Salazar and was the first of four to be held around the country to discuss how energy resources including oil, gas, wind and waves should be utilized as the new administration formulates its energy policy. It was held at the Atlantic City Convention Center, whose roof-mounted solar energy panels are the largest in the nation.In 2007, the Outer Continental Shelf, a zone extending roughly three to 200 miles from shore, accounted for 14 percent of the nation’s natural gas production, and 27 percent of its oil production.Salazar said it is essential that the nation fully exploit renewable energy resources to reduce its reliance on imported oil.By buying oil from countries hostile to the United States, “we have, in my opinion, been funding both sides in the war on terrorism,” he said.Environmentalists are urging the Obama administration to bar oil and gas drilling off the East Coast, and invest heavily in wind, solar and other energy technology.”This is a defining moment, whether we’re going to have a clean energy future or continue to rely on oil drilling,” said Jeff Tittel, New Jersey director of the Sierra Club. “Right now the government is fossil-foolish, and we need to change that.”But Skip Hobbs, a petroleum geologist from New Canaan, Conn., said oil and gas drilling has been shown to be safe.”We should recognize that as a practical matter, fossil fuel will rule for another generation,” he said.New Jersey is tripling the amount of wind power it plans to use by 2020 to 3,000 megawatts, or 13 percent of New Jersey’s total energy. In October, Garden State Offshore Energy, a joint venture of PSE&G Renewable Generation and Deepwater Wind, was chosen to build a $1 billion, 345 megawatt wind farm in the ocean about 16 miles southeast of Atlantic City.In Atlantic City, the local utilities authority has a wind farm consisting of five windmills that generate 7.5 megawatts, enough energy to power approximately 2,500 homes.Copyright 2009 The Associated Press.